History is a word based on the words of someone else. That may have seemed obvious enough, but I figured that it may help to shake the tree and start with something different, for once. For it is also the first time in a while that I have finished a book. 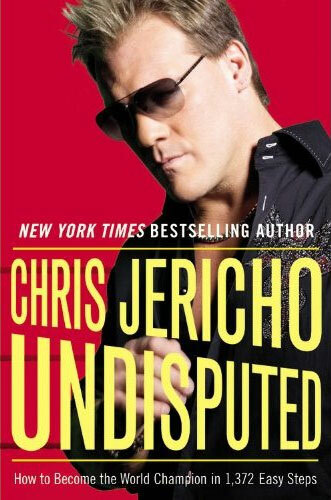 The book in question is Chris Jericho’s ‘Undisputed’, a biography based on the years following his arrival in the WWE all the way to the Second Coming, his return to wrestling at the backend of 2007. The book proved to be one of my wisest investments in recent times. For one, it is something that would probably be taken for granted. Those familiar with me know of my interest in Chris Jericho. Simply put, he is a fantastic performer on a number of levels. His wrestling skills are accomplished, and he appears to be the kind of wrestler capable enough to go through the number of different styles and matches required. He was also one of the more entertaining speakers on the mic. Funnily enough, I did not read his first book, ‘A Lion’s Tale’, which would be something more properly considered as an autobiography. In that, he charted his rise from his childhood days to the moment of his WWE debut. It got a lot of praise, but I never did get round to buying the book. I don’t know why. At the same time, I was also interested in Chris Jericho because he pursued his dreams. In ‘Up In The Air’, George Clooney’s character mentioned that children look up to sports stars because they chased after their dreams. In this case, even while he was performing, he toured and performed on a regular basis with his band, Fozzy. They did relatively well, in my opinion, but more than just that, he also pursued an active career in…well, almost everything else. He worked hard to become an actor, auditioning for roles in many different kinds of films and TV shows. For some of them, he was granted his wish, and performed in roles both big and small in TV, film and on the stage. He took acting classes, and even did some stand up comedy. In short, he showed me that it is not impossible to chase after your dreams. Even if you fail, you will have done more than others. More to the point of this post, it is a book that is well-written and enjoyable to read. I have not been reading recreationally for a while, only to prepare for my lectures. Reading for fun? Savouring over the words that my eyes layeth upon every few seconds, enjoying the process as these words deciphered themselves into images imprinted on my own psyche? The book that killed it for me was ‘A Doctor In The House’ by Dr Mahathir Mohamed. It was in the early chapters that I managed to discern a very defensive pose. He was quick to defend himself, taking up a more paranoid position than I had expected. Very quickly, it is clear that while his words are measured and strong, his story and history as we know it won’t exactly lie in bed comfortably with one another. Rarely do I get so worked up about something so miniscule. The use of footnotes can be helpful in providing more context, but though it is not a favourite of mine, here it becomes even more ridiculous. Why would a book written by a former prime minister of Malaysia require such minor definitions to be included? We would not expect a book written by Western personalities to include such footnotes as “London, capital of England”, do we? How condescending do we want to be to ourselves? I considered whether MPH, the publishers of the book, wanted to make it more accessible to people who aren’t familiar with Mahathir or Malaysia, but I’d argue that if you aren’t, then you have no business picking up an 800-page tome costing RM100 to begin with. People who are interested in reading his thoughts, in wanting to find out about Tun Mahathir’s side of the story would almost certainly know where Kedah is. Even if you still want to define it further, notes should have been given to the author to alter it to something like “I was born in Kedah, in the northwestern part of Malaysia.” That would have given an opening for Tun Mahathir to perhaps further explain certain ideals that comes with originating from that region. To me, they have a strong and special character, the Kedahans, and that could help to explain why they are responsible for producing so many people who rose to the top in Malaysia. Because of that, and other such definitions of words such as Agong, UMNO building, Perlis and even titles (“Malays have a complicated system of honorifics that convey esteem and respect”) was enough to piss me off that I did not do any recreational reading for over a month. Since it was a book I borrowed from my father, he has already started to ask some questions about it. After having finished ‘Undisputed’ in the morning, I closed my eyes, and let the thoughts swirl in my head. The joy of reading had been rediscovered, and as I recover from Jericho’s description of being analised by a metal pole (“It was like getting fucked by Robocop”), I leaned to my right, and saw Dr M’s smiling face at me, egging me on. I reached for it, and started from scratch. Now I’m at page 97.
regarding the footnotes, it's funny. i lmao. the writer/publisher knew the book would be an instant hit so why bother about those tiny lil details.